Co-founders of animation + illustration studio talk about facing rejection, pitching to FX and starting your own Instagram series. Before Gurleen and Anthony met each other, they were focusing on completely different crafts and disciplines. Gurleen was an artist and illustrator; Anthony was a musician, singer and burgeoning sound technician. But once they came together, inspired each other creatively, and started finding ways to collaborate, the animation studio Zim + Teemo was born. When they’re not delivering short animated series for big clients like FX Networks and Vox Media, they’re finding new ways to play with animation and new media for their own personal expression. This has resulted in their latest animation project, Get Up, Pierrot. 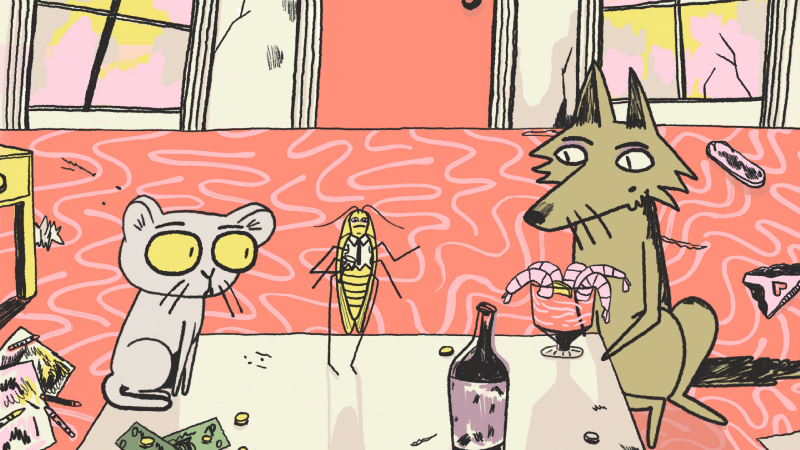 This Instagram animated series is one of the few out there where the audience gets to choose what happens next. The Zim + Teemo team talks with Miniflix about why they decided to start a choose-your-own-adventure series, how they created a devoted Instagram following before releasing a single clip of animation, and the hardest part about creating a show in which you don’t always know what happens next. Miniflix Interviewer: How did both of you get into the world of animation? What are your individual backgrounds? Gurleen Rai: I actually have a background in fashion design. I got my bachelor’s in fashion design, did that for a couple of years, and realized I wasn’t that invested in it. Then I transitioned into illustration. I went to the Fashion Institute in New York City for illustration… I’d never really even been thinking animation. It was other people who’d say, “you should consider animation.” To me, that was never something that seemed realistic….but then Anthony and I met, and I just started with little GIFS. I remember our first animation; I wanted it to be about 6 frames, really simple. But he just came in and was like “You can’t do this in 6 frames”. It ended up being over 300 frames. That was our first short film. Anthony Shepherd: I’ve been in bands for a long time…I started playing guitar when I was 12. Then I got into bands when I was like 16, 17. So that was most of my background with music, was just playing in bands… Because of being a singer, I got into the production side. I started recording all the rehearsals. By the time I was in my 20s, I was really good at recording bands. It wasn’t until later, when digital music became more accessible, that I got into exploring very different things. That totally opened me up to doing animation and film, because now I knew how to do a score, or at least try. Even on our first animation, I ended up having to learn how to do foley. So I’m just kind of in a process with us where anything that needs to get done, I’m gonna learn how to do it. G: Learn-as-you-go has been our motto. Miniflix: What’s the story behind Zim + Teemo? Gurleen: I started in 2015, just myself. At that time, I was only promoting my illustration work. I’m actually an editorial illustrator, so that’s why I started it. I didn’t just want to use my own name, because I pictured it being bigger than that, especially if I wanted to get into animation. 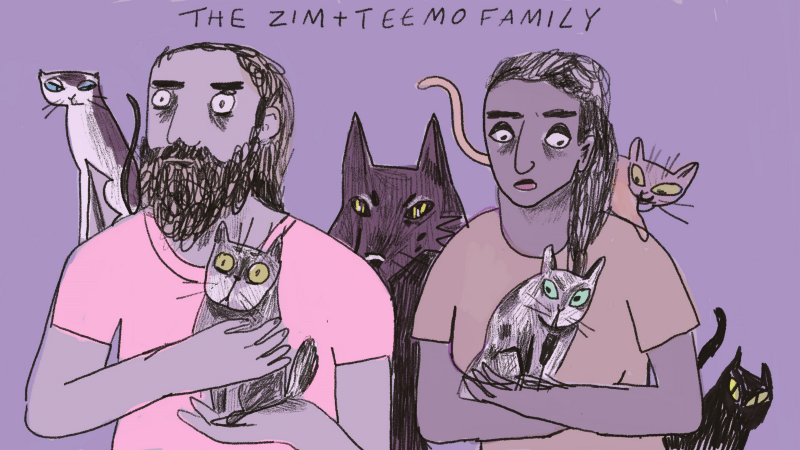 The name Zim + Teemo came from a dream I had. In it, I was walking around a gallery looking at an exhibit of paintings and the name of the artist was Zim Teemo. I woke up feeling so jealous of the artist because I wished I had made those paintings. It took me a minute to realize it was all a dream, there is no Zim Teemo and the art was just my imagination. So I essentially stole an imaginary artist’s name and added the “+”. M: You client list includes FX, Vox Media, and several magazines. What is your contribution to these clients? What creative deliverables are you sending their way? G: The FX Network commission was actually a short animated series that we did….and that hasn’t come out yet. They’re one-and-a-half-minute episodes. It’s something we just did this year. Three of the episodes screened at New Orleans Film Festival. And that was our very first animation commission. Before that, all my commissions had been for illustration, like the one for Vox Media, the magazines and all my other clients. I got those from emailing art directors and then them getting back to me, giving us this assignment…..
M: So you were just cold-emailing people? G: Yes. Sending out emails with a sample of my work is one of the biggest parts of my job. Sometimes I get a response back, sometimes I don’t, but that’s just kind of the reality of being an illustrator, which I think really translates well into the world of animation. As an animator, you’re submitting to film festivals all the time. You have to be prepared for rejection. But the story behind FX was that we met someone at last year’s New Orleans Film Festival. Through an industry meeting, we got in touch with someone from FX who was looking for animated content. We sent her a pitch and she liked it. It was actually a very fast process….I mean, we’d talked to someone from Adult Swim who says it usually takes 3–4 months just to get a greenlight for a project. But with this project it was more like 2 weeks later. M: Did FX control much of what you are creating, or ask for any major changes once they’d hired you? Anthony: They were pretty hands off. After we submitted the animatics, they told us to get everything down to 90 seconds. We had one at 3 minutes, so we had to do a ton of work. G: They gave us a few other notes too, but they were pretty hands off. I was definitely nervous about it. A: Most of the notes were from before we started writing. Things like dropping certain elements or focus on one thing instead of another. G: And it’s actually more nerve-wracking than giving a lot of feedback. Because if you’re not getting the feedback, you don’t really know if you’re on the right track. M: Do you know yet how that will be distributed by FX? G: It’s going to be on TV and it will also air online. A: But that’s about all the information we have. M: If I had to label an aesthetic or style for your videos, it’s be parody or critique mixed with an existential time-warp element. The videos often face the macabre aspects of life (death, loneliness, inability to control our lives in “Lonesome Death”) but always use an ironic subject to get there (Mickey Mouse in “Resolution”, the Pierrot figure in “Get Up, Pierrot”). What do you think you’re communicating through your body of work? Do you see a throughline in your animation projects? G: Resolution was the first animation we created, back in 2016. That was a social commentary. I feel like Mickey Mouse is so American — he’s the American boy, the American male. He can do whatever he wants. He gets away with whatever he wants to do. He does these horrible things and feels sort of sorry, and then there’s no consequences for him. Just a rinse and repeat. So that’s the reason I created Resolution with Mickey Mouse. “Resolution” was Zim + Teemo’s first animated project. And as for Get Up, Pierrot. That was definitely just created from a personal point of view. As a creative, you face a lot of rejection. You’re not quite sure if what you’re doing is any good, or if it really matters. But I still think it’s all not that serious at the end of the day. We get to play for a living. I don’t want to be too serious and self-indulgent about how I feel about the work. It’s a privilege to be able to do it. 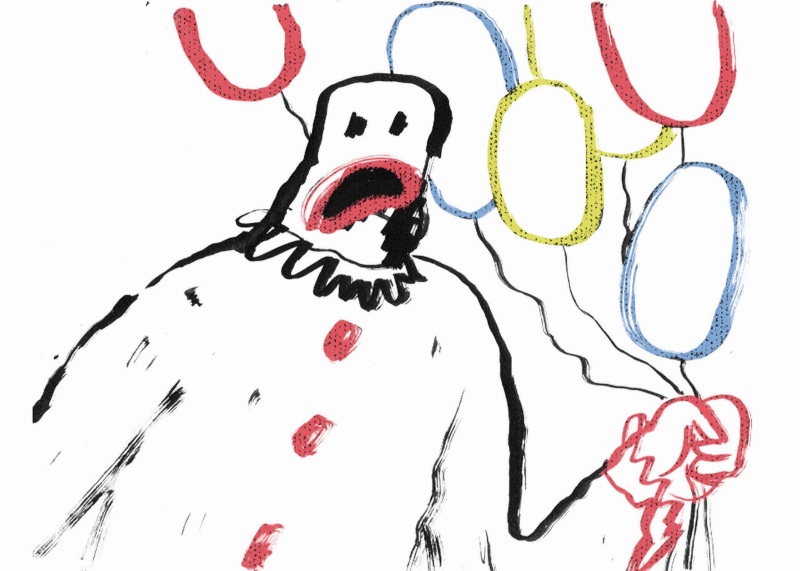 But hopefully people can resonate with the character of Pierrot: being this down, dejected person….being an artist. A: It’s intentional that we try to focus on things we want to talk about that’s also relatable. And we don’t take ourselves too seriously, so we’re always trying to be funny. I mean, there is truth to it. The existentialism is how we really try to reach people. We really want them to draw themselves into the character. And we really love to play with time and the idea of what came first. It’s also how we get back to rejection and anxiety. Sometimes we feel the rejection without there being actual rejection: just the thought of being rejected…even if you end up not being rejected. And not being exploitative is actually something we really focused on with writing Rosie and Joe. Because that was our real first go at comedy. We needed people to laugh. But most comedy is so exploitative, and so we wondered how we could write in a way that wasn’t that. M: What is the story behind “Get Up, Pierrot”? M: Did you frame the questions for choose-your-own-adventure in a way that made it a fail-safe, so you knew however they answered you’d know what to do? Or were they really left open for anything to happen? G: I really wish we’d been that smart in the beginning. We really weren’t. We tried to be very random. Then, towards the end, when we thought we needed to wrap it up, and that it needed to go somewhere and not become an endless series of events, we tried to be a little more strategic about the questions. Up until that point though, it’d been pretty random. A: There were days where we were ready to release on Instagram and we didn’t have our question. And I have to put the question out first, because if you post without a question to play, then that’s a bad way to do it. So we’d be ready to release and then wonder what our question would be. G: That was actually surprisingly hard. A: Coming up with the questions was sometimes the hardest part. And it’s because we weren’t being intentional; we weren’t thinking two weeks ahead. For example, she was finishing an animation and I would maybe have two nights to work on the music sometimes, if that. I give her all the time in the world, because she does the hard part with the drawings. So if she gives me a project Thursday night, and we need it released Friday afternoon, I get it done. M: What was it like to trying to get eyeballs on the Get Up, Pierrot Instagram page and making sure you had a good audience for this choose-your-own-adventure format? A: We both had alright profiles. 2,000 to 3,000 followers. So there was some overlap from those profiles into our Get Up, Pierrot page. But besides that, I tried to look for other people that were doing similar things, other choose-your-own-adventure formats. There’s not really a whole lot out there, especially in the animation space. I’ve seen others do it where they ask people to provide comments. But we just like doing the poll. That way we can post results. M: The sound design is so unique in this, in that it matches the rhythm of the cuts between frames or shots. Was that intentional, and how did you capture that? A: With Get Up Pierrot, I have control of the rhythm of the frame. Once I have the Photoshop file, I can speed up or slow down certain frames to change the rhythm. A lot of it I create intentionally, but some of the music — like the guitar and the organ elements — were from songs I’d already written… It’s a little bit of both. I control some elements of the animation to fit better with music I have, but I usually create new sounds for everything. M: Think of a particular instance where you have to create sounds to match a clip in days (or hours). Can you walk us through what that process is like? Do you have a sound library that you pull from or do you always try to create sounds whole-cloth? A: With Pierrot, it was usually crunch-time, but for those I did have a library. I would often just pull a sound from a previous episode. For an episode of Rosie and Joe for example, we had to rewrite everything within a week. So even the music was on the fly. I used a piece of music from a previous episode, but then I remixed it. Luckily I’m a very experimental musician, so I can pretty much plug in a keyboard, play with different sounds and land on something I like. It was about finding the melody I liked that would also fit the animation. And that’s what’s fun too. Many times I’ll try to play to the screen. Instead of making everything fit or drawing out the sheet music, I really like to get back to my roots as a musician and just watch the screen and try to keep up. M: What would you say is the thematic arc of Get Up, Pierrot? In “Get Up, Pierrot”, the title character searches for a true identity amidst constant rejection. G: I think it’s a search for identity. Because in life you’re not just your rejections, you’re not just these external things. So who are you? If you have to take out all of these other things, then you are forced to start asking these questions yourself. That’s why, even within the animation, Pierrot has so many versions of himself. You’re not always quite sure which one is the real one, or how many different versions of his identity there can possibly be. So the process of creating is like peeling the layers, letting them peel away and searching for that one true identity of self. A: And the only interaction he ever has with another person is questionable because even that person turns out to be him. It becomes a question of whether he’s projecting himself onto that person, or that person is projecting themselves onto him. There’s so many masks. When Pierrot takes off his mask, all you see is the back of a head. A: Frisky Dingo. That was the show that Adam Reed did, who was also the creator of Archer. But Frisky Dingo was a show that only got two seasons. I really loved that show, and it ended just as it was starting to get good. The Maxx was another one. That was an old MTV show that only got 11 episodes or something. It was animated and also very experimental for its time. It was a mixture of frame animation and CGI. Aeon Flux was probably where I started though. It was my first fascination with short animation. G: Yes, there’s an animator I’ve been into lately. Igor Kovalyov is his name. I’m particularly into his early 90s animation. Specifically, the film Hen, His Wife. I’ve always been a fan of Eastern European animation with its graphic hand drawn quality while also being very surreal and humorous. Igor’s work resonates with me because I feel like we deal with a lot of the same themes and imagery. To see more animated short films, comics and illustrations from Zim + Teemo, visit: http://www.zimteemo.com/ or follow all the latest projects from @zimteemo on Instagram.